This book was so darn creepy and delicious that I just want to take a moment to shriek: IT IS REALLY GOOD at you. Okay. I'm good now. I've done my shrieking. HAHAHA JUST KIDDING I HAVE SO MUCH TO SAY. So I went into this book knowing a lot of people liked it but not knowing really what it was about. <-- #StoryOfMyLifeSinceIAmTooLazyToReadBlurbs (My bad.) But it's basically about Mara Dyer (SURPRISE) who has PTSD after an accident that killed all her friends. So she and family move to a new town. Start a new life. But these weird hallucinations keep happening and Mara is freaking out of her braaaaaaain. AND IT'S REALLY ADDICTIVE. That's what I really long for in books!! I want to not be able to put it down!! I want to have 982343 questions and be flipping pages to find out!! Plus the writing style is really easy to read and it didn't feel bogged down with details or slow at any point. HUZZAH. And I really liked the hallucination aspect because it felt so...unhinged. The entire book really caught that. And it was shiveringly good. • It gets confusing towards the end. Like some of the circumstances are SO outrageous and unlikely I thought they'd end up being hallucinations...but...they weren't? Hmm. • Going off above...I had to suspend disbelief a lot. Me no likee. • Mara's parents seemed awfully eager to believe she wasn't having a rough time...maybe they were just being oblivious on purpose? But they seemed okay to let her run out with Noah ALL THE TIME when it was clear she should be, erm, maybe looked after a little more closely. • Mara's name is kinda a spoiler...Don't look up her name, obviously, if you don't want to know. But I knew already so I already figured out a TON of stuff about her just on her name. So that backfired for the author. Oops? • Also Mara gets a REALLY awesome friend, Jamie, who's like gay and black and genius and super interesting...but he sort of just gets dumped from the plot line?! Like he means ZERO to the story and then gets cut out and....I'm annoyed. I hate it when heroines can't have friends because all they can focus on is their BOYFRIEND. Meeerp. Basically it was a solidly liked book for me! YAYAYAYA. I haven't had one in a few reads now! BLISSFUL HAPPINESS. And by "happy" I mean so-many-people-got-murdered-and-it-was-freaky-and-I-need-the-sequel-right-now-because-dangit-cliffhanger-of-torture-right-there. Gotta love those endings. GOTTA LOVE THIS BOOK BASICALLY. 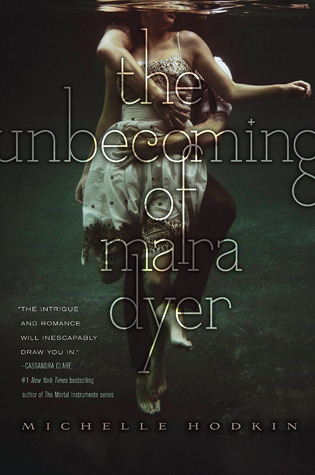 Sign into Goodreads to see if any of your friends have read The Unbecoming of Mara Dyer. 14.47% "This is creepy and delicious." 44.96% "It's taking me FOREVER to read this...not because it's bad. BUT JUST 'CAUSE I'M BUSY LATELY *dies* I have so many questions and I'm being tortured with no answers. \n Also Noah tho. N.O.A.H. That is all." Agreeing so much about Jamie! He was awesome, and then he disappeared. Me no like. @Annemieke: I hope he maybe comes back in the next books?!?! @Bieke: I'd say sorry...bUT I'M NOT. MWAHHAHHA. That's evil. But I still love you so. I've had this on my TBR for ages anyways. SIGH. This is my #1 favorite trilogy and your review made me want to reread the whole thing. STOP DOING THIS TO ME! I HAVE FINALS TO STUDY FOR! I am SO THRILLED that you liked it!!! And don't worry, Jamie comes back! He is the greatest. YESSSSS. CAIT. OH MY GOOD LORD. Wait until you finish Evolution. That ending is DEADLY. Aw, reading this makes me wish I could read the series again with a clean slate. *aggresively hugs this review because it is so so accurate* YES. I just want all of the others right now but I don't want them to fail?? ?